Join us aboard the newly built (2019) Dolphin XI as well as the Dolphin VIII, Dolphin IX and Dolphin X. Scheduled information for all trips are subject to weather conditions so please call for updated trip times. Schedule times may vary day to day depending on many factors: Trips are added and removed depending on demand, weather and other factors! For information for a particular date and time you may call our office directly. Reservations strongly advised for all trips and space is limited(use the BOOK A TRIP BUTTON to reserve now!) Please call 800-826-9300 to confirm. Remember reserve early! While processing your online reservation,your discount will automatically be applied by using the code below. Daily trip times may be added allowing your group additional scheduling opportunities, please check added availability when processing your online reservation. 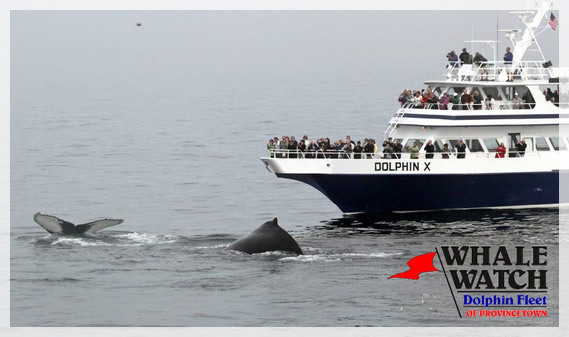 All whale watching trips are 3-4 hours in length. Please note that passengers purchasing tickets online will be scheduled on one of the four vessels. You will be informed of the vessel when you arrive. Our four vessels are as follows: Dolphin VIII, Dolphin IX, Dolphin X and Dolphin XI our newest vessel built in 2019! Our trips often fill to capacity, particularly during the summer season. All passengers with tickets must be checked in 45 minutes prior to scheduled departure. Passengers arriving late or after this time may be re-ticketed for a later departure as available. Please allow ample time for travel and parking. Ticket office located in the Chamber of Commerce Building at the head of the pier in Provincetown. Many delays can upset your your arrival time, the summer months can be a problem with traffic as well as parking so give yourself extra time. In July and August you must be checked in 45 minutes before departure time. click on the BOOK A TRIP button below to see the trip schedules for a given period. To receive discounted fares when you reserve online enter “whale” in Coupon Code. Online sales available for scheduled trips. Trips may be added or removed on short notice, check online ticketing for availability.